Propane Griddle (LP Gas) $1595 Save $35! Folding Leg Cart $300 Save $15! Leg brace $30 Save $10! 30# Propane Cylinder $75 Save $15! 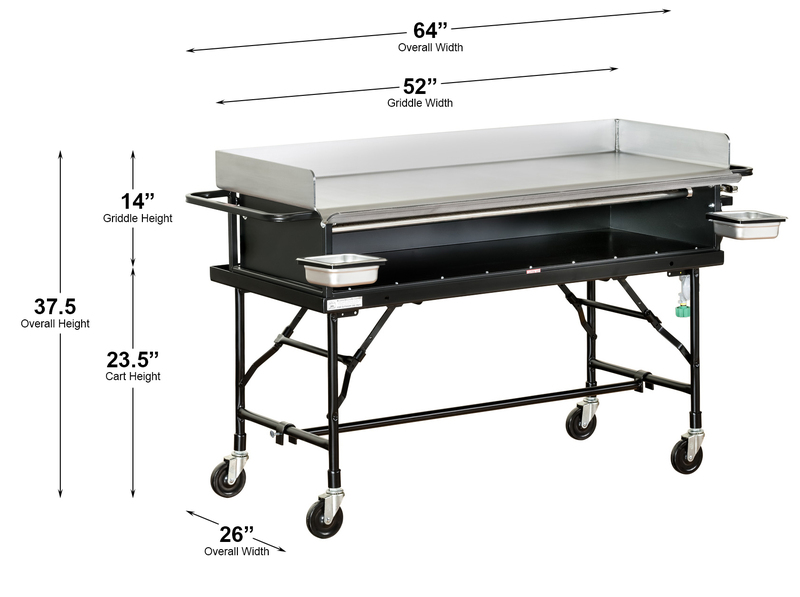 Our 52”, 128,000 BTU portable griddle has a large enough cooking capacity to feed any crowd, while still small enough to fit into most minivans, large SUV’s, and short-bed trucks. Separate folding leg cart and leg brace give our users enhanced ability to take this unit anywhere. Set it on a table or place it on the cart, you can take it to an off-site outdoor wedding or park it at a food festival. • 3 burner tubes rated at 42,000 BTU’s each and total BTU output of 126,000. • Optional Folding Leg Cart manufactured from 11 gauge carbon steel with black powder coat finish. • Shipment Dimensions: 77”L x 28”W x 40”H = 49.91 cubic feet, shipping weight is 300 lbs. Our folding leg carts feature a welded, one piece construction and are manufactured from 11 gauge carbon steel. The black powder coat finish ensures your folding leg cart will resist scratches, dings, and rust. It also features a dual locking system with easy rolling 4" casters. Powder coated steel leg brace is roughly 5' in length with 2 screws for easy tightening into place. Each of our griddle plates is bolted to a carbon steel body providing a sturdy base and protection during transportation. The carbon steel body can double as a warming/holding area for a prepared product. Four 4” solid rubber casters enhance maneuverability on the separate folding leg cart. The casters 1-inch stem threads into the folding leg cart frame creating unrivaled durability. Each 4” caster has a capacity to carry 125 lbs. Therefore, the overall carrying capacity of the wheels used on each portable griddle is 500 lbs. Under the steel griddle plate are 3 separate, wind resistant, steel burner tubes rated at 42,000 BTU’s each. Individually controlled burner tubes allow the surface temperature to be held uniform. You will not be disappointed with the heat output of a Big John gas griddle. Three separate, wind resistant burners are rated at 42,000 BTU’s each (126,000 BTU’s total). Each burner is independently controlled giving the user the ability to set each to a different temperature or all to the same temperature. This is great for chefs who want to cook all at once or choose graduated heat for cooking in the front and holding in the back. We choose to offer only 30# & 40# Worthington Cylinders with our products because they are engineered to be lightweight and durable. Each cylinder has a white, rust-inhibiting powder coat paint finish and is equipped with an Overfill Prevention Device. The comfortable hand-hold built into the collar makes for easy transportation of these of these cylinders that are manufactured to the Department of Transportation and Transport Canada specifications. 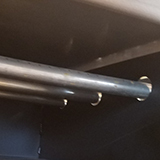 Each of our griddle plates is bolted to a carbon steel body and square-tube frame steel frame providing a sturdy base and protection during transportation. The carbon steel body can double as a warming/holding area for the prepared product.